There are over 1.7 million new cancer diagnoses each year in the US alone1. While recent advances in immuno-oncology and personalized medicine have the potential to decrease cancer deaths, there is still a lack of commonly-used early diagnostic tests to detect the presence of cancer before the patient experiences any physiological symptoms. Research into liquid biopsies as a tool for early cancer detection has been steadily increasing for the last twenty years2. While the main focus has been on circulating tumor cells and DNA, there are additional biomarkers present in bodily fluids that can also be analyzed. This review will highlight multiple types of biomarkers that can be found in the blood or urine, and the research efforts that have been taken to use these are biomarker signatures for early cancer detection. According to the World Health Organization, biomarkers are "any substance, structure, or process that can be measured in the body or its products and influence or predict the incidence of outcome or disease3". Many substances are currently used as biomarkers with varying reliability; the prostate-specific antigen (PSA) secreted by the prostate gland into the bloodstream is one example. While the PSA test is commonly used for the detection of prostate cancer in men, high levels reported by the test can also indicate benign conditions, such as an enlarged prostate or urinary infection. Unfortunately, false positives are extremely common in up to 75% of those tested for prostate cancer with the PSA test4. It is due to unreliable biomarkers such as this that new liquid biopsy tests mainly study the levels of circulating tumors cells, cell-free DNA, and exosomes containing additional nucleic acids5. There are benefits and drawbacks when analyzing each of these, and with each biomarker existing at different physiological levels in the fluid sample. Circulating tumor cells (CTCs) are cells that have been released into bloodstream or lymphatic system by primary tumors. If not cleared from these fluids properly, CTCs have been shown to relocate to other tissues and contribute to tumor metastasis. One challenge with studying CTCs is their relatively low abundance in the bloodstream; there could be as few as 10 CTCs per 108 white blood cells in certain samples. Enrichment and detection is the challenge when choosing to study these biomarkers5. Cell-free DNA (cfDNA) refers to DNA molecules that circulate in the bloodstream after cell apoptosis or necrosis. A specific portion of cfDNA that originates from tumor cells is referred to as circulating tumor DNA (ctDNA). Normally the blood is filtered and cleaned through multiple processes which eliminate foreign DNA6. However, if massive cell death occurs, e.g. if a part of a tumor is growing too rapidly and does not have adequate blood supply, excess DNA will be released into the bloodstream. The amount of cfDNA varies greatly depending on the condition, with reports that concentration can range from 1 - 100,000 fragments per mL of plasma7. Exosomes are 30 - 100 nanometer-sized extracellular vesicles secreted by multiple different cell types into the blood, urine, and culture medium of cell cultures. While exosomes do not have a specific known function, it was first proposed in 2007 that they can mediate intercellular signaling by transferring mRNAs and miRNAs between distant cells and tissues8. Since then, research into exosomal cargo has increased, with multiple groups studying the DNA, RNA, and protein levels found in patients with various diseases. Exosomes secreted by the mast cell line MC/9 (bone marrow-derived mast cells) contain vast amounts of functional RNA, but almost no DNA. 1,300 mRNAs and 120 miRNAs were found, and upon in vitro incubation with lysate they were successfully transcribed into protein. This led the research group to term these molecules "exosomal shuttle" RNA (esRNA)9. As of 2018, there is only one FDA-approved liquid biopsy test available for the early detection of cancer. The cobas EGFR Mutation Test v2 aims to detect specific mutations in the epidermal growth factor receptor (EGFR) in non-small cell lung cancer (NSCLC) patients (NSCLC is the most common type of lung cancer and responsible for close to 200,000 deaths in the US each year). This liquid biopsy is not a universal test for anyone to detect the presence of NSCLC, but rather a test that will improve the personalized care each patient receives. Some patients may benefit from the test's accompanying drug Tarceva (erlotinib), which treats NSCLC that contains the EGFR mutations10. Predicine — a startup company based out of California, USA and Shanghai, China — recently released data on a new liquid biopsy that detects both ctDNA and ctRNA. The test, called Gene RADAR, was introduced at the American Association for Cancer Research (AACR)'s 2018 meeting11. Singlera genomics, a second startup company, developed PanSeer and ColonES. Both tests rely on detecting circulating tumor methylated DNA (ctmDNA) through methylation haplotype analysis. Sequencing is conducted on enriched samples and searches for adjacent methylation sites on DNA sequences12. In 2018, a paper published in Science proposed a new liquid biopsy test with great promise called CancerSEEK. 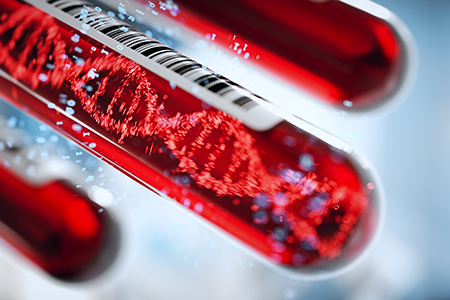 This blood test detects eight common cancers through analysis of the levels of circulating proteins and mutations in cfDNA13. While this blood test received much hype and press, some reviews are not as encouraged by it just yet14. The liquid biopsy research field is extremely active with great promise from some newly developed tests. The challenge going forward will be refining these tests to prevent false positives, which could cause distress to the respective patients. Additionally, to produce blood tests that can be competitive in the market, they will need to be less expensive and more accessible than current diagnostics. 1. Cancer of Any Site - Cancer Stat Facts. National Cancer Institute (2018). Accessed: 8th January 2019. 2. Lichtenfeld, L. & American Cancer Society. Liquid Biopsy: Past, Present, Future. (2018). Accessed: 9th January 2019. 3. United Nations Environment Programme., International Labour Organisation., World Health Organization. & International Program on Chemical Safety. Biomarkers in risk assessment : validity and validation. (World Health Organization, 2001). 4. Slatkoff, S., Gamboa, S., Zolotor, A. J., Mounsey, A. L. & Jones, K. PURLs: PSA testing: when it's useful, when it's not. J. Fam. Pract. 60, 357-60 (2011). 5. Neumann, M. H. D., Bender, S., Krahn, T. & Schlange, T. ctDNA and CTCs in Liquid Biopsy - Current Status and Where We Need to Progress. Comput. Struct. Biotechnol. J. 16, 190-195 (2018). 6. Pisetsky, D. S. & Fairhurst, A.-M. The origin of extracellular DNA during the clearance of dead and dying cells. Autoimmunity 40, 281-284 (2007). 7. Gretchen Brune. What is Cell-Free DNA (cfDNA)? (2017). Accessed: 9th January 2019. 8. Valadi, H. et al. Exosome-mediated transfer of mRNAs and microRNAs is a novel mechanism of genetic exchange between cells. Nat. Cell Biol. 9, 654-9 (2007). 9. Lotvall, J. & Valadi, H. Cell to cell signalling via exosomes through esRNA. Cell Adh. Migr. 1, 156-158 (2007). 10. FDA approves first blood test to detect gene mutation associated with non-small cell lung cancer. (2016). 11. Predicine. Accessed: 9th January 2019. 12. Singlera Genomics. Accessed: 9th January 2019. 13. Cohen, J. D. et al. Detection and localization of surgically resectable cancers with a multi-analyte blood test. Science. 359, 926 LP-930 (2018). 14. A Review of CancerSEEK. IASLC Lung Cancer News. Accessed: 9th January 2019. Submit your email address to receive our monthly Taconic Insights newsletter.